Light up those beautiful features with our new Duo Chromatic Illuminating Powders. Available in five dual-finish shades, this silky powder is uniquely formulated with light-catching pearls that glows differently from every angle. Holographic perfection for any skin tone! Twilight Tint – White base with blue duo chromatic pearls. Lavender Steel – Soft lavender with pink & lavender duo chromatic pearls. Crushed Bloom – Dusty rose with pink & light blue duo chromatic pearls. Synthetica – Pink base with gold duo chromatic pearls. Snow Rose – White base with pink & lilac duo chromatic pearls. Pro tip: Brush this illuminating wonder along the highest points of the face—such as the cheekbones, bridge of the nose and Cupid’s bow for a gorgeous glow that’ll make ‘em double take. Availability: NYX stores and selected Clicks stores. I am saving my pocket money for this!!!!!! This weekend I went shopping with my cousin and her baby @ Gateway , Durban. Like any other make up crazy girl, I went into every make up store broke as hell and looked at what is new in the hood. 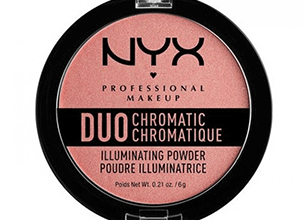 I also popped into the Gateway Clicks store and there they were the NYX Duo Chromatic Illuminating powders. I managed to swatch these babies (duh) and they are absolutely worth the buck. They are must haves for sure!!!!!! !